Getting a great deal is always the goal but when considering your overall Sayulita vacation budget; start by thinking about how much time you plan on spending at your Sayulita rental house. If your goal is to spend every day at the beach and to eat all your meals out at restaurants, maybe a smaller, less expensive option would work for you. Conversely, if you plan on spending lots of time by the pool and cooking meals at home (or having a Sayulita chef cook them for you), spend a little more to make sure your casa has the space and amenities to make those plans a reality. Prices for Sayulita vacation rentals (and real estate) are typically listed in US dollars and rentals can range from $50 per night for a modest apartment or casita to $1,000+ for a luxury mansion overlooking the ocean. Most Sayulita rentals are priced on the lower end of this spectrum. Note that prices also vary from less expensive in the low season (summer) to more in high season (winter) or holidays. Sayulita is an increasingly popular place, especially during holidays, so start your search early. If you find a place you love, book it – it might not be available for long. If you stay at a place and love it, consider booking again next year and making it a tradition. The best place to get started is the SayulitaLife Quick-Search page. Sayulita is a compact town built around the scenic Sayulita Bay and divided north and south by an arroyo (seasonal river) that runs during the rainy summer season and dries up during the winter months. This river also distributes sediment each rainy season at the river mouth which is what creates Sayulita's great surfing waves. View the SayulitaLife map here. Keep in mind that these maps are two-dimensional and some of Sayulita's vacation rentals are perched on hills; consider both linear distance and elevation. Beyond location on the map, Sayulita's vacation rentals offer a variety of different neighborhoods to choose from, each with their own charm and advantages. Whole articles could be written about Sayulita people and geography but here is a super quick summary of the neighborhoods in which you are most likely to find vacation rentals. Sayulita SouthWorking from left to right on the map, south side Sayulita is the closest to Playa Carricitos, Playa de los Muertos and the south side of the main beach where the fishing boats park and surf lessons take place. This friendly and usually quiet neighborhood is a mix of vacation rentals. Local Mexican homes, and residences of people from around the world who have made Sayulita home. This mix translates to restaurants and grocery stores priced for locals and is generally considered quiet, but like almost anywhere in Sayulita, you may hear the occasional serenade by the town's many free-range roosters. Sayulita CentralStraight up from the main beach you will find Sayulita's plaza. This is the epicenter for Sayulita's nightlife and home to many of the town's best restaurants. If you want to be in the heart of the action, close to live music, entertainment, and steps to the main surf break this is the spot for you. No need to rent a car or golf cart here. Sayulita North EndStarting from the north side of the river and heading north towards Nanzal Hill this neighborhood offers easy access to the less busy north side of Sayulita's main beach and also nearby Playa Mal Paso. While farther from town and not as convenient, it can be more tranquil and spread out. Some of the nicest homes in Sayulita are located here and most have easy beach access. Nanzal In the early 2000's a new neighborhood of mainly luxury homes started popping up on this large, north side hill. It is now home to a wide selection of rental homes (many of them gated) and some of the best views in Sayulita. Access to this area is steep and a rental car or golf cart is recommended for most properties. 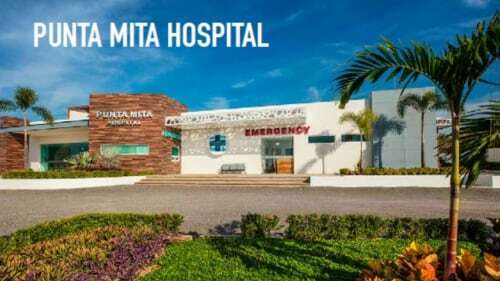 Tamarindo Located between the river and the north side of Gringo Hill and a little further from the ocean this neighborhood features fewer vacation rentals and more Mexican family homes. It is perfect for those wanting to experience a little bit more local culture and maybe save a few dollars. If Tamarindo appeals, also consider another emerging vacation rental neighborhood named Avestruz. Gringo HillIn the 1980's some of the first foreign-built homes were built on this hill overlooking the plaza and straight out to Sayulita Bay. Gringo Hill has now grown with a variety of homes facing every direction offering sweeping ocean and jungle valley views plus consistent refreshing ocean breezes. The walk up this hill is a bit steep but not overwhelming. Occasionally, homes on the northwest side of Gringo hill might hear town nightlife. Out-of-Town If getting away from it all is the goal consider a variety of options outside or on the outskirts of Sayulita. 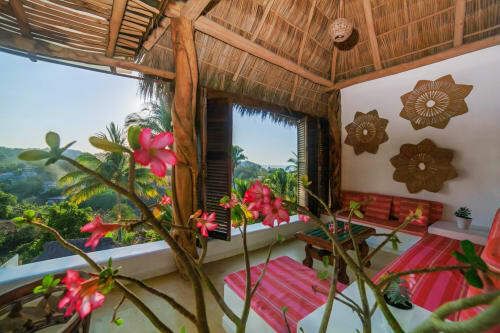 Whether it is a villa on secluded beaches or jungle cabin, these vacation homes can offer unsurpassed privacy and quiet while still being close enough to drive into Sayulita for a day at the beach, to pick up groceries or enjoy a dinner out. Remember even "out-of-town" locations are usually less than a 5-minute car ride to the plaza. The convenience of central location can come with some give and take…being close to everything makes for easy walks for dinner or groceries but while some might enjoy the sound of late night music wafting through the air as they drift off to sleep others who are more sensitive might want to look for a place a little further from the plaza. 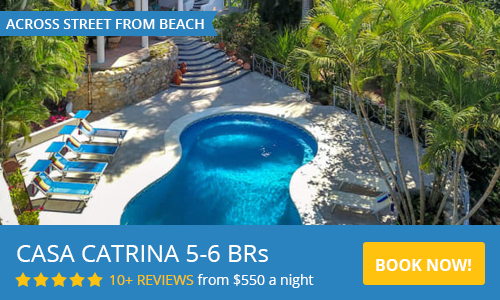 Sayulita has many beautiful homes with sweeping ocean and jungle views and whether you are waking up to the blue ocean or watching a sunset over rolling green jungle, having a great view can be an amazing plus to your vacation experience. Keep in mind when choosing a view home that with many of these unobstructed views comes elevation and hills that will be need to be climbed to get home each day. If you have concerns, ask the owner about elevation and the steepness of hills and consider renting a golf cart to make trips to and from town fun and easy. For many, the ultimate in beach vacation is staying right next to the beach. This can make for great views and super easy-of-access to the sand but usually runs at a premium price. Beachfront is nice but definitely not a necessity for a stellar Sayulita vacation. Pools are a great option for a refreshing morning dip, cooling off after a day at the beach or for spending some quiet time with a book. Many parents of young children appreciate how much their children love spending time splashing in the pool, giving them some time to relax. If you are looking for a place with a pool other considerations are if there is a safe, shallow end for younger kids, if the water is chlorine or salt for sensitive skin and if the pool is heated or not as they can be cooler during the winter months of December through April. Pools are expensive to build and maintain; this price will often be reflected in the cost of your rental. Sayulita is wonderful place for kids and yours are going to love it. Some vacation rentals are much better suited to hosting children than others. Some rentals cater to families while others might actually prefer adults only. Choosing a casa that works well for kids can mean increased safety features like railings on staircases, smaller individual or twin mattresses, keeping fragile artwork out of reach and offering beach toys and pool inflatables for guest use. Some Sayulita rentals offer free items for guests to use and others rent these items for nominal fees. Something as simple a set of folding beach chairs, umbrella, a boogie board or a sand castle making equipment can really add to your quality of life. If you are traveling with small children, you can rent baby gear if your rental does not provide it. Some houses now even have golf carts that they include with your rental or offer at a discount. Not all houses in Sayulita have Internet or WIFI. This is great if you plan to unplug and will not need regular Internet on your vacation. If you do need occasional access you will find WIFI at many of the towns restaurants and if you are traveling without a smart phone or computer there are also a few Internet cafes where you can rent time at a desktop to send some quick emails or Facebook messages. While unplugging is great, many travelers still need to stay connected with their businesses while on vacation. There have been great improvements in the quality and range of internet in Sayulita, however not all homes offer the same speed of internet. If you need regular access to high speed internet at your casa for work (or Netflix), ask if your rental home offers a new premium service called Sayulita WiFi. ot all houses in Sayulita have Internet or WIFI.? Often overlooked when booking a vacation rental but can make a huge difference to providing good night sleeps, fluffy towels and sheets make your vacation the restful and pleasurable experience it should be. Another luxury item that is not standard in all Sayulita vacation rentals is air conditioning. A necessity to some renters but not for all, A/C is definitely something to consider during the warmest, most humid summer months (July – October). Most houses do offer ceiling fans and in the winter months the air temperature at night can be really fresh. Most vacation rentals in Sayulita have a gardener and housekeeper. These hardworking Sayulita locals can make a big difference in your stay, providing light housekeeping in your casa, keeping common areas clean and maintaining the pool. Other considerations are private chefs to help with big meals, a concierge to help organize reservations day trips, and a driver to take you to and from the airport and on other adventures. Regardless of where you stay please consider tipping your housekeeper and any other member of the team who went out of their way to make your vacation more enjoyable. Walking is the best way to get around the village, and saves you from searching for a parking place. Most casas post fairly accurate estimates of walk times, i.e., 5 min. to the plaza or 10 min. to the main beach. If these are not posted, you can ask your host and/or guestimate using the maps on SayulitaLife.com while also taking into consideration any changes in elevation. Walking is safe and enjoyable in Sayulita and a great way to work off the extra tacos and margaritas you might be enjoying. If you plan to do a lot of walking, smart packers might bring a few pairs of sandals and some comfortable walking shoes. As Sayulita's popularity grows (parking is often extremely difficult) more and more locals and vacationers are switching from cars to easy-to-park fun to drive golf carts. A Sayulita golf cart can make exploring the town easier and a day at the playa with beach chairs, umbrella and a cooler a breeze. Make sure to check that your vacation rental has an easily accessible electric outlet. While a car might not be required for day-to-day use in Sayulita, having access to a car can make day trips to neighboring towns or nearby surf breaks possible. If you do plan to rent a car, consider if your rental house is car accessible and if it has off-street parking. Sayulita has its own fleet of taxis and whether it is a big trip like taking you back to the PVR airport or to a nearby town on a day trip or a smaller fare like a ride up the hill after a long day at the beach, these guys have your covered. Cabs are easiest to find at the plaza and near the bus stop at entrance to town. Most vacation rentals require a deposit to secure a reservation. This amount can vary but 50% is common with the remaining amount payable closer to your arrival time. This is standard practice in the industry and is designed in part to prevent people from making reservations they do not intend to keep. If you have narrowed your search down but are having trouble choosing between two or three options, spend a little time reading their reviews. These can give you a little more insight into what previous guests have enjoyed and if they have had any issues to mention. 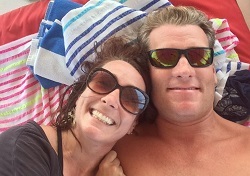 After moving to Sayulita six years ago with my wife Wendy, we started enjoying a steady stream of friends and family who wanted to visit us in our new, tropical paradise. In addition to providing taco tours and tequila tastings, we were often asked to help them find the perfect accommodations. In doing so we started to become local experts on what Sayulita had to offer and which properties (and which neighbourhoods) worked best for which people. We were inspired by the many unique and beautiful vacation homes and by the range of vacation experiences Sayulita provides. This year we were able to realize a life-long dream when we built our own guest house, Casa Vecino. We planned, designed and furnished it with the goal of making our guests' stay pleasurable, comfortable and memorable. We are not alone. Sayulita is home to hundreds of unique properties and amazing owners who share our passion for hosting and hospitality. We all love Sayulita and are excited to share it with our guests!